The roof on your home is the first line of defense against the harsh elements. It needs to be able to hold up and protect you. Your roof holds off many enemies and today’s newer shingles do a much better job of protecting you when compared to shingles and roofing materials from years ago. 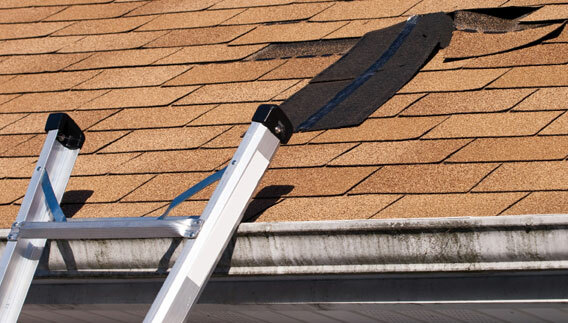 However, an improperly maintained roofing system can prematurely break down and fail early. Below are some of the items that can bring on a shortened roof lifespan. Sun & UV Rays: The heat and UV rays from the sun can take its toll on roofing shingles. The shingles, over time, can deteriorate and become hard, brittle and begin to curl up or break apart. Hail: Hailstorms wreak havoc on homeowners roofs brought on by strong storms. Hail will physically damage roofing shingles. Holes, dimples or the loss of shingle material which will cause the roof shingle to fail and leak. If you experience a hail storm you should have your roof professionally inspected by one of our expert roofing inspectors at Metropolitan Design/Build to ensure your roof is able to protect your property properly. Wind: Strong and powerful winds can blow shingles off, lift single edges allowing debris and water to penetrate causing damage. Once the seal of a shingle is broken it may flap in the wind until it completely breaks off leaving your home susceptible to leaks and water damage. Rain: Rainwater is a huge problem for roofs and it seems to find tricky pathways under singles, flashing, and roofing materials penetrating roof decking boards causing wood rot and other structural damage. The moisture from rainwater can bring on mold and mildew which can affect the lifespan of singles, sub-materials, and roof decking. Snow & Ice: The Maryland, Virginia and DC area is always at risk in the winter months from roof snow and ice damage. Passing ice and snow storms in this area have damaged countless roofs and cost homeowners millions of dollars in damages. When melting and refreezing, water works its way under flashing and shingles. 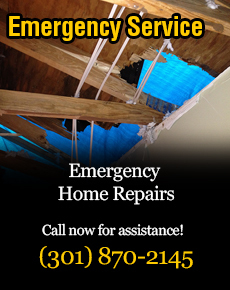 Ice dams can quickly form causing damage to the roofing system, roofing substructure and even attics and drywall. Newer building codes require special materials been used to help prevent ice damage in roof valleys and along roof edge lines. Condensation: Condensation is another condition that occurs when warm moisture rich air builds up in attics brought on by poor ventilation. The condensation can prematurely destroy the roofing substructure by rotting wood sheathing and roof rafters. A properly ventilated attic will normally prevent condensation from forming. Some homes have ridge vents, gable vents and or power vent fans to keep air moving and allowing the flow of air to prevent condensation for forming. Depending on the style roof system your home has, you may have one or several of these systems in your home to allow your attic to breath properly. Airflow is just one key factor to ensure you have a long roof life. Algae and Moss Growth: Dark stains and or green mold can be seen on many of today’s aged roofs. Moss and algae tend to grow in moist areas and once it takes hold on the shingles, it tends to hold even more moisture. It’s this moisture that will cause rot and deterioration of shingles and roofing systems. Trees and large bushes should be trimmed regularly to help keep the growth of algae and moss on your house’s roof. Poorly draining gutters can also bring on the growth of moss and algae. Newer roof shingles are treated to help prevent the growth of these ugly dark staining problems from forming. Trees and Leaves: Having large trees and overhanging branches can also cause roof damage. Powerful storms can blow branches onto your roof, causing thousands of dollars in damage. The leaves from trees collect and cause moisture to form and prematurely deteriorate your roof. Tiny twigs can be forced under shingles by wind allowing rain and moisture to penetrate the sub-roof system causing rot and damage. Flashing Deterioration: Bad or leaking flashing many times is the culprit of leaking roofs. If a roofs flashing is not tight and caulked properly around vent pipes, skylights, chimneys, brick, and siding areas, water will find its way in. Over time the heat in summer and cold from winter will dry out caulking causing it to crack and form leaks around flashed areas. All flashing should be checked regularly during your roofing inspections. Vent pipe collars and all vent caps should be replaced when signs of cracking are found.